There are 3 posts tagged ipl. There are not many leg spinners in world cricket today. Neither were there 20 years ago, until Shane Warne (along with Anil Kumble) brought it into fashion again. Leg-spin is not only about skill, it is like an art, and like all work of artists, watching him bowl is always a treat to watch. When he begins to ‘walk‘ his short run up, it is marked by the ball being tossed from the right hand to the left by those artful wrists. With eyes and mind focussed on the plan, the ball is released from his hands towards a batsman who is confused about the flight, the dip, the speed, and the amount of turn the ball will take after pitching. Two decades before he came onto the international scene, fast bowlers have ruled world cricket like never before. Despite the fact that executing and mastering leg-spin is extremely difficult, he came up trumps and made his own bewildering English and South African batsmen with a puzzle which they will never solve. His humiliation of Mike Gatting and many other batsmen by his enormous turn, masterful googlies and surprising flippers made for a wonderful sight for cricket lovers who were tired of seeing West Indian bowlers destroying batting lineups. South African Daryl Cullinan was believed to have sought the help of a therapist to overcome Warne’s psychological hold over his batting. 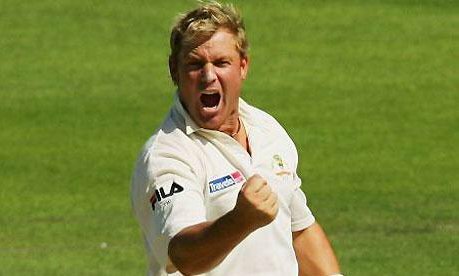 Gideon Haigh, the Australian journalist, said of Warne upon his retirement: “It was said of Augustus that he found Rome brick and left it marble: the same is true of Warne and spin bowling.” Though known mostly for his 708 wickets in Test cricket, he was highly effective in ODIs too, with his twin man of the match awards in the semi-final and final matches being instrumental in handing Australia the World Cup in 1999. He was something with the bat too, having the highest number of runs without a century with two 90+ scores under his belt. He was also a successful slip fielder, and stands seventh in the list of most catches. Like all this was not enough, he signed up for Rajasthan Royals in the IPL in 2008 after retiring from one dayers in 2003 and test matches in 2007. As captain of perhaps the most weak side in the tournament, he turned a group of nobodies into a formidable team and led them to an unprecedented victory in the first version of IPL. Many remarked him as the wiliest captain Australia never had. His overs were always a fun to watch rather than just individual balls because of the way he planned and plotted the dismissal of his preys. It was the same spirit and guile he showed as a captain when he led Rajasthan Royals to IPL victory. On and off the pitch, his life can be compared to a typical bollywood masala movie. His story is a tale of women, bookmakers, diet pills, then more women, but certainly headlines all along the way. Coming to cricket, he was one of the five players ranked by Wisden as the greatest cricketers of the 20th century. In 1993, he took 72 victims, and in 2005 took a massive 96 wickets coming after a one year ban. His control over the degree of spin, and his flippers, sliders and zooters made the life of many a batsman miserable. He was also invited to see Sir Donald Bradman along with Sachin Tendulkar. If ever there was a Bradman of bowling, it has to be him. He has always been my favorite cricketer, right on the top with Sachin Tendulkar. His presence on the cricket field is itself magical and the whole stadium and the commentators are totally entertained by his tactics. With the bowl in his hand, anything can happen. He can turn a match around with a few overs, with the 1999 World Cup semi-final being the best example. He is as arrogant as any Australian, yet humble enough to acknowledge that he had nightmares of Sachin Tendulkar hitting him for sixes. No one has had a more colorful career than him, full of achievements as a magician and mischiefs as a maverick. He retired from one dayers in 2003, tests in 2007 and now he has announced T20 retirement in 2011. Looks like all well-timed decisions. I have watched IPL for the last few years and supported Rajasthan Royals only because he was playing. IPL will miss him. I will miss him. Cricket has certainly been left poorer by his departure.